Gutter masters technicians have installed thousands of seamless gutter systems on residential homes, commercial buildings/offices, warehouses and industrial buildings. Home owners often underestimate the importance of a properly functioning seamless gutter system; in fact, an improperly installed/designed gutter system can do more damage to a home’s exterior or foundation than no gutters at all. Contrary to popular belief, not all gutter systems are created equal. Here at gutter masters of Peoria we take pride in our team of technicians and continue to raise the standards of the seamless gutter industry by offering the highest quality materials coupled with unbeatable customer service. 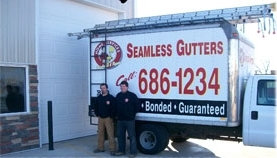 The Gutter masters team offers gutter installations from concept to conception. Gutter masters technicians will diagnose any rainwater issues and offer the most cost effective solution available.